More Bento Stuff to Giveaway! I’ve been overwhelmed by the entries that I’ve decided to up the ante a bit. Luckily, I found a few more interesting items during my most recent bento foray so here’s three more things to add to the set. 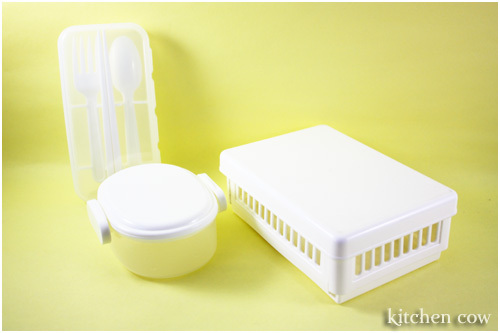 â€¢ A small V-color box, perfect for side dishes and desserts. â€¢ A V-color utensil set which contains a spoon, a fork, and chopsticks. The packaging suggests that it can be slipped into the top compartment of the V-color 2-tier set that’s also included in the giveaway. If you’d like to have these things, it’s not too late to sign up and join the giveaway. You have until April 30, 2008. Just my way of saying thanks! Once again, to all who participated, Maraming salamat! 3 Responses to More Bento Stuff to Giveaway! That’s very generous of you !